In that same span of two weeks, DeSantis has created what some conservatives are celebrating as the most conservative state Supreme Court in America. The Republican governor probably has already produced his most important legacy — a 6-1 ardently conservative Supreme Court majority — that will far outlive the eight years he can serve in office. “Liberals should be weeping after these three (Supreme Court) picks. Now let’s move some litigation,” Republican consultant Brett Doster, an adviser to former Florida Gov. Jeb Bush and former Alabama Senate candidate Roy Moore, crowed on Twitter. It came after DeSantis made his third appointment to the Court on Tuesday — Carlos Muñiz, the former counsel to Pam Bondi and Bush. Republican leaders frustrated for decades by the state’s top court thwarting their agenda on restricting lawsuits, expanding school vouchers, drawing Republican-friendly legislative districts, impeding abortions and more would seem at long last to have a strong ally at last in the judicial branch. 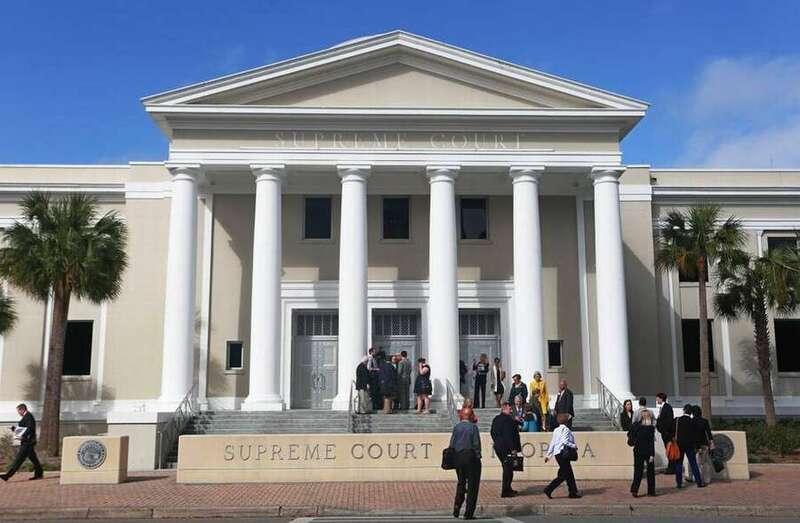 “You can make a credible case that the Florida Supreme Court is now the most judicially conservative court in the nation,” said Richard Doran, a prominent Republican attorney in Tallahassee and member of the conservative Federalist Society. That influential network of conservative and libertarian lawyers picked the pool of candidates for President Donald Trump’s U.S. Supreme Court nominees and screened the pool of justices DeSantis considered. DeSantis has been active in the society since his days at Harvard Law School, and Federalist Society Executive Vice President Leonard Leo even flew down from Washington to Orlando to interview the 11 finalists for the three Florida vacancies. DeSantis picked Muñiz, and Miami appellate judges Barbara Lagoa and Robert Luck, creating a 6-1 conservative majority. Predicting how judges will rule based on their political ideology or Federalist Society affiliations is no sure thing, of course. “I don’t think you can assume just because they’re appointed by a Republican governor and might have the imprimatur of being conservative that they’re not intellectually honest,” said Miami Beach Mayor Dan Gelber, a Democrat and former prosecutor and state senators. He knows both new justices from Miami and said they have impeccable reputations. But what is certain is that Republicans at least have control of all three branches of state government. Democrats have criticized DeSantis for creating a court that for the first time in 36 years will have no African-American and for appointing Muñiz when he has no experience as a judge. Florida’s Supreme Court will tilt right for generations because elections have consequences and voters elected Ron DeSantis over Andrew Gillum. Nobody questions the intellect or integrity of the three new justices, however.